August 3, 2018 Plenty of free fighting games to go around during Evo 2018, but Dragon Ball FighterZ isn’t one of them. Evo 2018 is happening this weekend, bringing the biggest fighting game tournament on the scene back for another annual round. We’ll see some of the best players in the world competing in the genre, and you’ll be able to get your practice rounds in at home, too – four of the big titles on display at Evo are offering a free weekend on Steam alongside the event. The free promotion notably does not apply to Dragon Ball FighterZ. 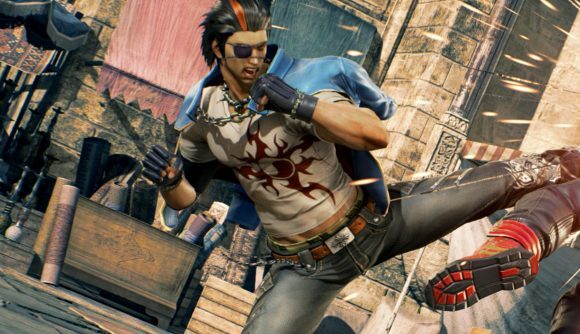 The anime-themed fighter offered a free download option when the promotion went live, but the button was removed shortly after – we assumed it was a temporary tech glitch, but didn’t receive a response when we asked Bandai Namco for comment. A day later, it’s safe to say you won’t get any free time with DBFZ this weekend. Instead, you can get access to Street Fighter V, Tekken 7, and BlazBlue: Cross Tag Battle, letting you play as much as you like through the weekend. Those titles are all on sale, as well, and they’re joined by discounts on DBFZ, Guilty Gear Xrd -Revelator- and Injustice 2. So if you want to enjoy a bunch of fighting games on Steam this weekend, you don’t have stick to Twitch to do it. Check out Steam’s Evo 2018 promo page to see the games for yourself. The discounts and free titles are live now, and will be available until Monday, August 6, at 10:00 PDT / 13:00 EDT / 18:00 BST. Enjoy it while it lasts. Evo 2018 proper begins today largely with pools for the big main stage games, though you can look forward to an exhibition for the upcoming Soulcalibur 6 and Super Smash Bros. Ultimate this evening. Saturday hosts finals for Injustice 2, BlazBlue Cross Tag Battle, and Super Smash Bros. for Wii U. Finally, Sunday will feature the tournament’s biggest games, starting with Guilty Gear Xrd: Rev 2 and continuing through Super Smash Bros. Melee, Tekken 7, Dragon Ball FighterZ, and Street Fighter V. (Yes, folks, despite DBFZ’s impressive entrant numbers, Street Fighter is still the main event.) Check out the full schedule over at Shoryuken, or head to Steam get to fighting for yourself.